On reddit manga they talked a lot about this manga, so back in 2017 I started reading it and I wait every week for a new chapter. Story: we are at Grace Field House were a lot of orphans live togehter with pther kids and "Mama", a woman who takes care of all the orphans. All children live happily until the age of 12, when they finally finds someone that will take care of them. They daily life is simple: in the morning, after breakfast, they take some tests and after that they are free to play outside. There are some rules: to not leave the orphanage since the outside world is dangerous and to never venture past the gates. One day, two children, Emma and Norman, break the rules and discover the secret about Grace Field House and the outside world. The story is really good, the first arc is a little horror and really interesting. The manga have some major arcs that are really good (while after the first one it wasn't that interesting). There's a lot of characters and they are well developed. Everyone has a role and it's easy to remember every character that appeared in the manga. Plus, there's a lot of mysteries that are slowly discovered.The art is good but sometimes seems that the drawing were made really quickly... but that's not a problem since they are cute. The landscape, later in the manga, are really well drawn. Story: in the 19th century many chefs in China tried their best to improve their skills. But that's not all! This China is one that has many famous chiefs that cooked for important persons. If you were to insul a high-grade chef you could land a person in hail but fopr chiefs it's not all that easy: they have to gain respect and power or else they can lose everything in a few minutes. Our main character, Mao Hsing Liu, lost his mother at the age of 13 years old but it's not sad because he has a dream: take his mother's restaurant. He win in a "Battle of cuisine" but before becoming the chief at his mother restaurant, Mao needs to travel China in order to learn more of the many ways of cooking and to take the title of Ultimate Chief. The story is really straightforward but in a few of chapters you can't stop reading. The main character Mao is a character really well made, you don't notice his development because it's the food he makes that is his development or how he solve some issues. Tha manga is really old (1995!) but I enjoyed it a lot, same for the food battles and the story. I'm a little sad that the last chapters are more of a a collection of short stories than the main story but they are nice to read. The true problem with this series is that there's a sequel, Shin Chuuka Ichiban!, and for now there isn't any fan tranlsation so we can say that the series is incomplete. The art of the characters sometimes is simple and the author at times use funny faces but all the pages are really good to look. There's some double pages and they are really detailed and really well made! Like always, here's the annual manga Reading Challenge!! This challenge follows a section-upgrading system. -- Everyone must begin the challenge as a Novice. -- You can only move to the Apprentice level after you have completed 10 of the Novice items. -- To move to the Intermediate level, you must first complete 15 Apprentice items. This means you can only read manga for one section at a time. -- If the last manga you completed for Novice has a finish date of January 31st (on your form), then all Apprentice level items must have start dates of January 31st or later (on your form). You cannot begin reading manga for Apprentice items on January 30th. -- Manga which have more than 20 volumes can be started at any time during the challenge period. -- Expert bonus items can be started at any time during the challenge period; however, remember that you must complete the Advanced level before you can turn-in your form as Expert. [Started: Jan 18] [Finished: Jan 24] (N.01) Read a collection of short stories. [Started: Jan 18] [Finished: Jan 22] (N.02) Read an award-winning manga. 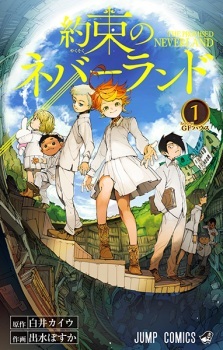 [Started: Jan 12] [Finished: Jan 16] (N.03) Read a best selling manga. [Started: DATE] [Finished: DATE] (N.04) Read a manga from a magazine with less than 250 titles listed in the database. [Started: DATE] [Finished: DATE] (N.05) Read a manga serialized in a shoujo magazine. [Started: DATE] [Finished: DATE] (N.06)Read a manga serialized in a shounen magazine. [Started: DATE] [Finished: DATE] (N.07) Read a manga that started serialization before 2015. [Started: DATE] [Finished: DATE] (N.08) Read a manga that has been adapted to anime. [Started: Jan 18] [Finished: Jan 18] (N.09) Read a manga series you can finish in one day. [Started: DATE] [Finished: DATE] (N.10) Read a manga that is 1 to 5 volumes in length. [Started: DATE] [Finished: DATE] (N.11) Read a manga ranked BELOW 1,000. [Started: DATE] [Finished: DATE] (N.12) Read a manga with less than 10,000 completed members. [Started: Jan 26] [Finished: Feb 13] (N.13) Read a manga with a score of or above 8 on MAL. [Started: Feb 14] [Finished: Feb 15] (N.14) Read a manga with a score of or below 6 on MAL. [Started: Jan 09] [Finished: Jan 12] (N.15) Read a manga about food, music, or art. [Started: Jan 14] [Finished: Jan 14] (N.16) Read a Drama or Romance manga. [Started: DATE] [Finished: DATE] (N.17) Read a Comedy or Slice of Life manga. [Started: Feb 14] [Finished: Feb 14] (N.18) Read a manga with a non-human main character. [Started: DATE] [Finished: DATE] (N.19) Read a manga about school. [Started: DATE] [Finished: DATE] (N.20) Read a manga that is on one of the active MRC staff's to-read list. [Started: Jan 14] [Finished: Jan 17] (N.21) Read a manga with a number in the title. [Started: DATE] [Finished: DATE] (Ap.01) Read a web/4-koma manga. [Started: DATE] [Finished: DATE] (Ap.02) Read a manhua or a manhwa. [Started: DATE] [Finished: DATE] (Ap.03) Read a prequel/sequel to a manga that you've already read. [Started: Apr 03] [Finished: Apr 13] (Ap.07) Read a manga by a female author/artist. [Started: DATE] [Finished: DATE] (Ap.08) Read a manga serialized in a josei magazine. [Started: Feb 15] [Finished: Mar 17] (Ap.09) Read a manga serialized in a seinen magazine. [Started: Mar 24] [Finished: Apr 11] (Ap.10) Read a manga that started serialization before 2005. [Started: DATE] [Finished: DATE] (Ap.12) Read a manga that has been adapted to live-action. [Started: Feb 16] [Finished: Feb 18] (Ap.14) Read a manga that is 6 to 10 volumes in length. [Started: DATE] [Finished: DATE] (Ap.15) Read a manga ranked BELOW 5,000. [Started: Mar 10] [Finished: Mar 23] (Ap.16) Read a manga with less than 5,000 completed members. [Started: DATE] [Finished: DATE] (Ap.17) Read a manga with more users listed in Plan to Read than Completed. 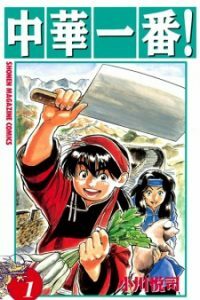 [Started: DATE] [Finished: DATE] (Ap.18) Read a manga about or involving mythology/folklore/etc. [Started: DATE] [Finished: DATE] (Ap.21) Read a Sports or Games manga. [Started: DATE] [Finished: DATE] (Ap.22) Read a manga with a child main character. [Started: Feb 19] [Finished: Mar 21] (Ap.23) Read a manga with an adult main character. [Started: DATE] [Finished: DATE] (Ap.24) Read a manga with a cast consisting of mostly one gender. [Started: DATE] [Finished: DATE] (Ap.25) Read a manga that has a protagonist who is the gender opposite to the demographic. [Started: DATE] [Finished: DATE] (Ap.27) Read a GAR manga. [Started: DATE] [Finished: DATE] (Ap.28) Read an active MRC staff member's listed favorite manga. [Started: DATE] [Finished: DATE] (I.01) Read a gekiga manga. [Started: DATE] [Finished: DATE] (I.02) Read a light novel. [Started: DATE] [Finished: DATE] (I.03) Read the first or earliest work of your favorite creator (writer, etc). [Started: DATE] [Finished: DATE] (I.04) Read a manga from a magazine with less than 100 titles listed in the database. [Started: DATE] [Finished: DATE] (I.05) Read a manga published in the same magazine in which your favorite one was serialized. [Started: DATE] [Finished: DATE] (I.06) Read a manga published in an online magazine. [Started: DATE] [Finished: DATE] (I.07) Read a manga of a demographic that can apply to you. [Started: DATE] [Finished: DATE] (I.09) Read a manga that started serialization before 1995. [Started: DATE] [Finished: DATE] (I.10) Read a manga that has been adapted to drama CD. [Started: DATE] [Finished: DATE] (I.11) Read a manga adapted from light novel, video game or original anime. [Started: DATE] [Finished: DATE] (I.12) Read a manga that is 11 to 15 volumes in length. [Started: DATE] [Finished: DATE] (I.13) Read a manga ranked BELOW 7,000. [Started: DATE] [Finished: DATE] (I.14) Read a manga with less than 1,000 completed members. [Started: DATE] [Finished: DATE] (I.15) Read a manga that is scored higher than its anime adaption. [Started: DATE] [Finished: DATE] (I.16) Read a manga about otaku. [Started: DATE] [Finished: DATE] (I.17) Read a Sci-Fi or Horror manga. [Started: DATE] [Finished: DATE] (I.18) Read a Psychological or Supernatural manga. [Started: DATE] [Finished: DATE] (I.19) Read a manga that takes place outside of Japan, but in the real world. [Started: DATE] [Finished: DATE] (I.20) Read a manga that has a main character that is a professional in their field. [Started: DATE] [Finished: DATE] (I.21) Read a manga about angels or demons. [Started: DATE] [Finished: DATE] (I.22) Read a delinquent manga. [Started: DATE] [Finished: DATE] (I.23) Read a manga about space. [Started: DATE] [Finished: DATE] (I.24) Read a manga from the ones listed under manga relations in the Hidden Gems of Manga club. [Started: DATE] [Finished: DATE] (I.25) Read a manga recommended to you by another participant in the discussion thread. [Started: DATE] [Finished: DATE] (I.26) Read a featured manga. [Started: DATE] [Finished: DATE] (I.28) Read a manga that has 6 or more words in its title. [Started: DATE] [Finished: DATE] (I.29) Read a manga with a one word title. [Started: DATE] [Finished: DATE] (I.30) Start and catch up to the current chapter of an ongoing manga. 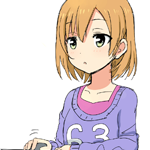 [Started: DATE] [Finished: DATE] (I.31) Read any manga recommended to your Favorite Manga listed in profile. 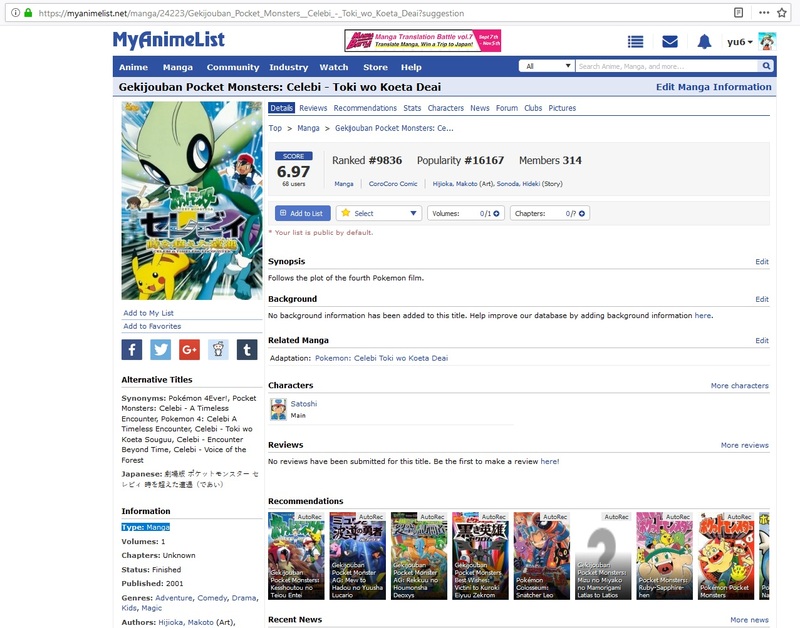 [Started: DATE] [Finished: DATE] (Ad.01)Read a manga from a magazine with less than 50 titles listed in the database. [Started: DATE] [Finished: DATE] (Ad.02) Read a manga that started publishing the same month as one of your listed favorites. [Started: DATE] [Finished: DATE] (Ad.03) Read a manga that started serialization in the 70s or 80s. [Started: DATE] [Finished: DATE] (Ad.04) Read a doujin based on a series you've read. [Started: DATE] [Finished: DATE] (Ad.05) Read a manga that is 16 to 20 volumes in length. [Started: DATE] [Finished: DATE] (Ad.06) Read a manga ranked BELOW 10,000. [Started: DATE] [Finished: DATE] (Ad.07) Read a manga with less than 500 completed members. [Started: DATE] [Finished: DATE] (Ad.08) Read a completed manga scored 10 or 9 by the user that posted directly above/below you. [Started: DATE] [Finished: DATE] (Ad.07) Read a manga based on a real event or person. [Started: DATE] [Finished: DATE] (Ad.10) Read a manga about or involving the Yakuza. [Started: DATE] [Finished: DATE] (Ad.12) Read a genderbender manga. [Started: DATE] [Finished: DATE] (Ad.13) Read a manga that another participant has completed for this challenge. [Started: DATE] [Finished: DATE] (Ad.14) Read a manga suggested by MAL or by Anime+. [Started: DATE] [Finished: DATE] (Ad.15) Re-read a manga. [Started: DATE] [Finished: DATE] (Ad.16) Finish an on-hold or dropped manga. [Started: DATE] [Finished: DATE] (Ad.17) Read a manga which title starts with the first letter of your username. [Started: DATE] [Finished: DATE] (Ad.18)Read a manga with only one English letter in the title. [Started: DATE] [Finished: DATE] (Ad.19) Read a random manga assigned to you by a challenge staff member. 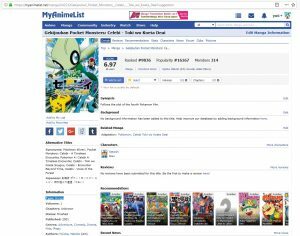 [Started: DATE] [Finished: DATE] (E.01) Read a manga from a magazine with less than 25 titles listed in the database. [Started: DATE] [Finished: DATE] (E.03) Read a manga that is 50+ volumes in length. [Started: DATE] [Finished: DATE] (E.04) Read a manga ranked BELOW 15,000. [Started: DATE] [Finished: DATE] (E.05) Read a manga with less than 100 completed members. [Started: DATE] [Finished: DATE] (E.06) Read a manga with a score of or below 5 on MAL. [Started: DATE] [Finished: DATE] (E.07) Read a manga scored 4 or less by an active MRC staff member. [Started: Jan 14] [Finished: Jan 14] (E.08) Read a manga with no reviews.